We need more than just fire safety; we need fire justice, and a culture which takes stock of the fact that it is the poor and the disadvantaged who die in natural disasters. Smoke billows from Grenfell Tower. Victoria Jones/PA Wire/PA Images. All rights reserved. Anyone following the tragic events surrounding the Grenfell Tower fire on 14 June will have been struck by the calls for justice made by the survivors as well as by many other groups in society. Justice may seem an unlikely value to invoke in such circumstances – especially in a western democracy like the United Kingdom – where a reasonable degree of social equality is assumed. Fire has a distinctive profile among hazards in that it is a great destroyer of property but rarely proves fatal even in the highly flammable slums and informal settlements of the developing world. The Grenfell Tower fire is unusual in that the death toll is high. In fact, over two weeks after the event, the death toll appears still undetermined or at least unannounced. Over 95% of deaths and burn injuries are in low-and-middle-income countries where they mainly affect the very poorest in society – and such fires rarely make international news. Even a cursory glance at the faces of those confirmed dead and still missing presents a gallery of the most disadvantaged groups in British society: the aged, the disabled, the unemployed, single mothers, ethnic minorities and refugees. What makes this impression even starker is that Grenfell Tower is a public housing block standing in one of the most affluent boroughs in the country. Inevitably, in a city where the total number of fatalities from fire last year was 36, the loss of so many lives with such a pronounced socio-economic profile raises serious questions about what caused it, whom it affects, and why it was allowed to happen. Urban fire is a singular hazard: it has a set of properties that distinguishes it from all others. Unique among hazards, fire is “owned” in that its source of origin lies within a person’s property and largely depends for its ignition on a range of factors: the actions or inactions of the owner; what has been placed in that space; and the provisions made to mitigate or suppress its ability to spread. It is also, to all intents and purposes, the only “natural” disaster initiated entirely by humans, since the incidence of urban fire ‘auto-generation’ or self-generation (as opposed to wildfires) is so rare nowadays that it can be effectively dismissed. Yet these special properties of fire are seldom acknowledged, and their incidence passes largely unrecognised in international databases. Urban fires, for instance, are the only major hazard not included as a category in the IFRC’s annual World Disaster Report. Yet fires still cause over 300,000 deaths annually and are the fourth largest cause of accidental injury. The reason for this partial invisibility, perhaps, lies in the fact that over 95% of deaths and burn injuries are in low-and-middle-income countries where they mainly affect the very poorest in society – and such fires rarely make international news. This relative invisibility may explain why the social construction of fire is so poorly represented in the literature on disasters. While the emphasis in disaster studies has long shifted away from a simple agent-specific focus to a consideration of what renders people unsafe, a condition that is largely dependent on social structures and a person’s relative (dis)advantage, fire is still largely discussed in terms of its physical properties and and how it can be extinguished. ‘Vulnerability’ – the term mainly used to assess the nature and extent of people’s risk, as a gauge of a person’s exposure to hazard and a measure of their capacity to recover from its loss – is less frequently invoked in discussions about fires. 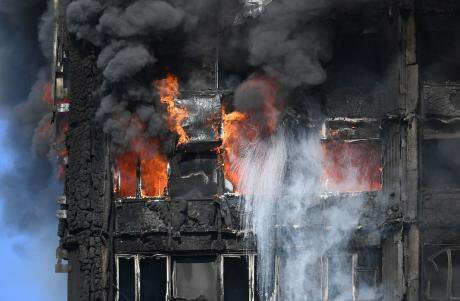 The calls for justice in the case of Grenfell Tower demonstrate the need to understand fire as more than simply a matter of fire load and heat release rate. Fire is also a question that touches upon the underlying social issues that leave some people more exposed to its effects than others. As the risk of fire is not evenly spread throughout society, it is left to the state to ensure that groups disadvantaged by physical limitations and disabilities or socio-economic factors are protected: government has a moral and legal responsibility to create a culture of “fire justice” as well as fire safety that safeguards all its citizens to a minimally acceptable level. The notion of “fire justice” has its roots in a particular conception of the state and forms of governance in western societies that conform to liberal democratic models. According to the environmental lawyer Robert Verchick, the failure of the state to protect its own from this perspective can be regarded as nothing less than “a breach of democracy’s fundamental obligation to its citizens”. Government has a moral and legal responsibility to create a culture of “fire justice” as well as fire safety that safeguards all its citizens to a minimally acceptable level. The question of justice also inevitably raises the notion of blame: was there someone or some agency that failed in their responsibilities? Without some causative or blameworthy agent, one invested with power and authority and a duty of care, argued the political theorist, Judith Shklar, there cannot be an injustice. In modern western societies, this accountability is invested in the state, which is charged both with ensuring social justice; that there is a level of equality in the distribution of benefits and burdens across all segments of society; and, with environmental justice, that the spatial distribution of hazard and risk is not unduly concentrated at any particular locations. However, there have been some striking examples in recent years where western states have manifestly failed in their duty of care to their citizens and the shroud of invisibility that hid its victims has been rent asunder. Hurricane Katrina in August 2005 focused world attention on the enduring legacy of racial segregation and poverty in the American South where the storm impacted much more heavily on minorities, the poor, and the elderly. The Fukushima Daiichi nuclear disaster in March 2011 (sometimes referred to as Japan’s “Katrina”) disproportionately impacted on poor, blue-collar workers who bore higher medical risks to radiation releases, were less adequately assisted and were not consulted in the cleanup and recovery operations. The Grenfell Tower fire and its aftermath raise similar issues as regards British society by making visible those poor and disadvantaged groups who disproportionately constitute most fire victims. In fact, there are “Grenfell Tower” fires every day in this country but the household scale of the event renders them largely invisible. There has always been ample anecdotal evidence based on local fire service personnel’s knowledge that some groups and neighbourhoods are more vulnerable to fire than others. However, there is far less direct research to support this view – but there is some. A study commissioned by the Cambridgeshire Fire and Rescue Service found a direct correlation between types of neighbourhood and people most at risk of residential fires. Authorities in Britain, however, seem reluctant to publicly admit the existence of underclasses of any denomination. A report to the Department for Communities and Local Government on attitudes towards fire risk in 2008 suggested instead that people may best be segmented according to lifestyle/lifestage, household type, and attitudinal characteristics, “rather than simple age or ethnicity categories”. Similarly, the shroud of invisibility was quickly drawn over the fatal fire at Lakanal House in Camberwell where six people died in 2009 by focusing on emerging issues of fire safety rather than fire justice. The scale of the death toll in Grenfell Tower, however, suggests that it may be more difficult for British society to ignore the question of justice in this case. Certainly, the continuing media interest and the hundreds of angry protesters that descended on the offices of Kensington Town Hall or marched through central London to Downing Street chanting “no justice, no peace” seem intent to make it so.